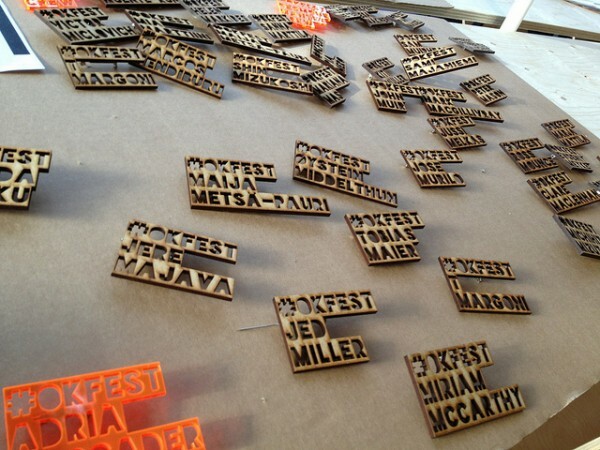 The first Open Knowledge Festival (#OKfest) took place in Helsinki, Finland, September 17-22, 2012. The festival, arranged by the UK based Open Knowledge Foundation was dedicated to the growing culture of openness extended through digital technology. Following that spirit it covered 13 different “topic streams” coordinated by multiple program planners and attracting talks, panels, workshops and hackathons pitched through an open call. Throughout the festival 6 of the many parallel sessions were constantly streamed live online, all of these recordings are (openly) available. The topic streams included everything from Open Democracy and Open Development, through Open Cities and Open Education, to Open Design and Data Visualization. The one thing shared throughout the sessions was a conviction that opening things up is generally a good thing that can leads society in the right direction. I was in Helsinki as a guest of Pixelache and the Mushrooming Network giving a workshop titled Dis-Information-Visualization (more on that in a different post). My contributions to OKfest was two slightly more skeptical sessions in the Open Design (Wikipedia Illustrated) and Open Cities (Life in the Urban Panopticon) streams. Yet as a volunteer with the Israeli Public Knowledge Workshop (PKW) I was mainly interested in discussions around government transparency and civic engagement. This is also what I focus on in this post. The Open Knowledge Foundation is mainly an Open Gov NGO, so the Transparency and Accountability topic stream was a prominent one. On the first morning session of the first day after a few speakers gave their case studies, there was a lightning round presenting around 25 different government transparency projects from around 25 different places in the world. Each presenter was given 2 minutes and one slide. Funny enough most of them spoke of pretty similar efforts and challenges: governments reluctant to release data, lack of standardization, efforts to find partnerships with representatives, and so on… I could’ve just repeated the same story for our work in the PKW but instead I decided to tell the uplifting story of the “Opening the Finance Committee” project — the committee’s protocols were berried in print archives and our volunteers decided to force them open by scanning and crowdsourcing their digitization. 12 hours after launching the project’s website, the government got the message and released the protocols online in a machine readable format. We got some enthusiastic claps for that. Another interesting session focused on ways for parliament monitoring organizations (PMOs) to collaborate, especially under the umbrella of the joined “Declaration on Parliamentary Openness”. The declaration, signed by more than 80 orgs (including us) from more than 55 countries, is a collaboratively written document laying out principles and best practices for governments to follow and for PMOs to push for. The 44 points document is not necessarily something to expect govs to fully implement at once (though it could be nice), it is mainly used as a platform for cross-pollination between PMOs and as a tool of leverage to further advance the cause. María Baron, from the Argentinian Directorio Legislativo, shared their strategy in using the document even before it was published. They got their government (which she personally doesn’t like that much) invested in advance as a partner and invited them to actually comment on and influence the declaration. Her group evaluated the Argentinian government’s standing on each of the 44 points in the document, not comparing them the UK or the Netherlands, but to the neighboring Chile, Peru, Paraguay & Uruguay. When it was clear that in this comparison the Argentinian gov is not looking so good, they warned they’ll be going to the press with the alarming results. The government in response set a joined work group with the PMO to change the reality for the better. The declaration is written as a live document. It can receive inline comments adding local perspectives. Even better, it is built to collect local examples and updates that can serve as case studies and leverages for parallel efforts. An interesting remark from Sarah Schacht (from Knowledge As Power) was that in most cases the politicians can’t necessarily change much in the government’s approach to openness as it’s the clerks who set the standards. Beyond the big words about democracy and transparency that politicians would gladly align themselves with, the staff has to be on board. It is true that some clerks won’t act without higher political will, but they often are much more critical players in the process than we usually consider. We won’t win them over by waving open standards and democratic euphemism but by listening to what they need and by understanding what the tools mean for them. We should remember that their focus is mostly on the document management system, for them openness is an after thought. In this conversation I have also learned about two relevant projects that are gaining some global interest. The first, Akoma Ntoso (http://akomantoso.org), is a machine readable XML format for parliamentary, legislative and judiciary documents. The second, Bungeni (http://Bungeni.org) builds on top of Akoma Ntoso to provide a suite of (Python based) open source tools for drafting, managing, consolidating and publishing legislative and other parliamentary documents. The names of these projects may sound African, that’s because they are. In these projects openness is not an afterthought but a foundational essence. Obviously, once standards and tools are shared the potential for cross-PMO Open Source collaboration is huge. The steps to take full advantage of this document initiative is to print it, translate it, localize it (make it fit the local political system and culture). Out of the 44 points in the declaration, each country can choose to focus on its few target points, then obviously share examples and updates with the other PMOs by annotating the living document and participating in the mailinglist. As engaging and exciting as it was, almost all of the conversations in the festival seemed to be very low level – more about opening data, less about what to do with the data once open. Personally, I feel like the openness is just the beginning, and even if it is not complete, heck, even if we have to get the data by scraping PDF files, open knowledge is not only about informatics. It got me thinking about the time when we chose to call our NGO the “Public Knowledge Workshop”. At first I regretted the departure from the term “Open Knowledge” that was already spreading around Europe. But now I think that “Public Knowledge” is actually a much more committed term. Open Knowledge can be piles of valuable books freely and openly available to read, inspect, remix and distribute, even if no one actually does that. Public Knowledge means that data, information, knowledge, are being used and shared, not just potentially but actively. This requires much more than making the data available, it requires us to put it into action, and much more, to get it to drive civic engagement and to actively improve not only our information systems, but our societies at large. Trying to be proactive, I grabbed Banjamin Ooghe, from the French PMO Regards Citoyens, for a one-on-one session. He gave me a demo of the parliament monitoring work they do and I responded with a demo of our projects. They’re doing some interesting stuff with search and automation, taking advantage of the Open Source Solr search engine. They’re also making much less use of user generated content than we are. I posted my interview of him demoing on YouTube, to show the gang back home. I loved his response to the way some activists rush to declare themselves as non-partisan. He said: “We’re not non-partisan. We’re trans-partisan.” We were both tremendously inspired and agreed that this is exactly what the next OKfest (next year, in Switzerland) should have more of. Let’s make it happen!